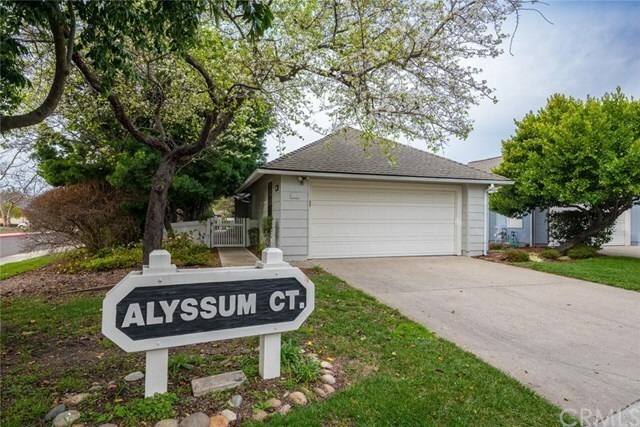 Charming, spacious and private, 2 bedroom/2 bath, single level garden home on corner lot in the desirable Willowbrook II development of San Luis Obispo, with updated kitchen, a built in breakfast bar, loads of counter and cabinet space, and access to a lovely deck. The open floor plan, living room skylight, and fireplace add to the ambiance of this well designed home. The large master bedroom boasts a walk in closet, a wall of built-in storage, and sliding doors leading to another deck and generous yard space. Plenty of room for gardening, or just relaxing. An attached two car garage with laundry hook ups completes the picture. Close proximity to French and Islay Parks, shopping, and hiking trails. Priced well at $555,000. Directions: From Tank Farm Rd, turn south onto Poinsettia. Home is on the corner of Poinsettia and Alyssum.